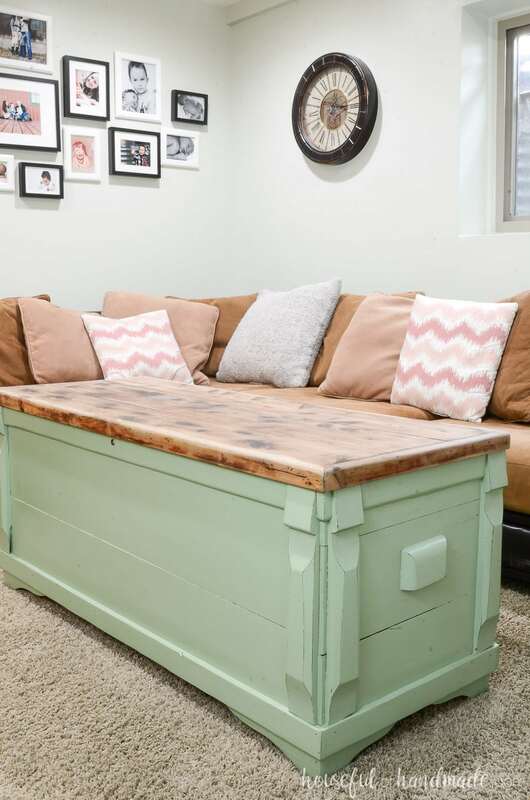 Transform an old attic chest into a beautiful coffee table full of storage. On a recent trip to the thrift store, I came across this old cedar chest. It had lots of damage to the decorative feet. But the main body was in good condition. And the giant cedar chest was perfect for storage. 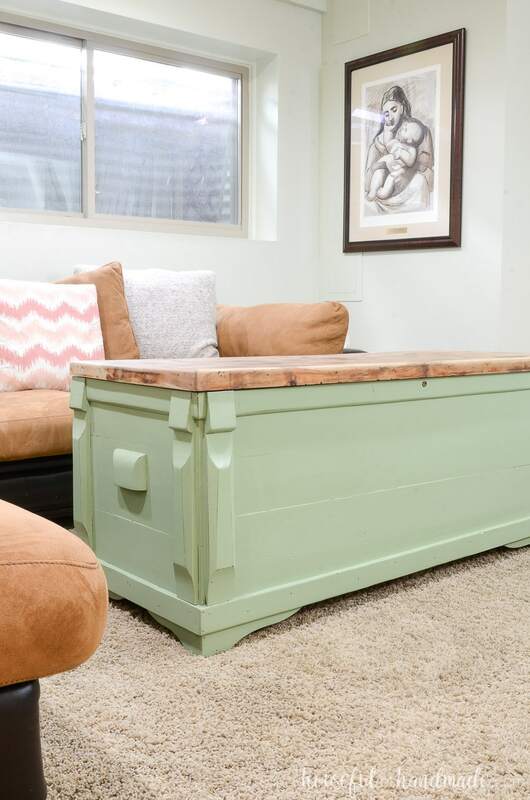 So I grabbed it up to upcycle the chest into the perfect coffee table for our living room. 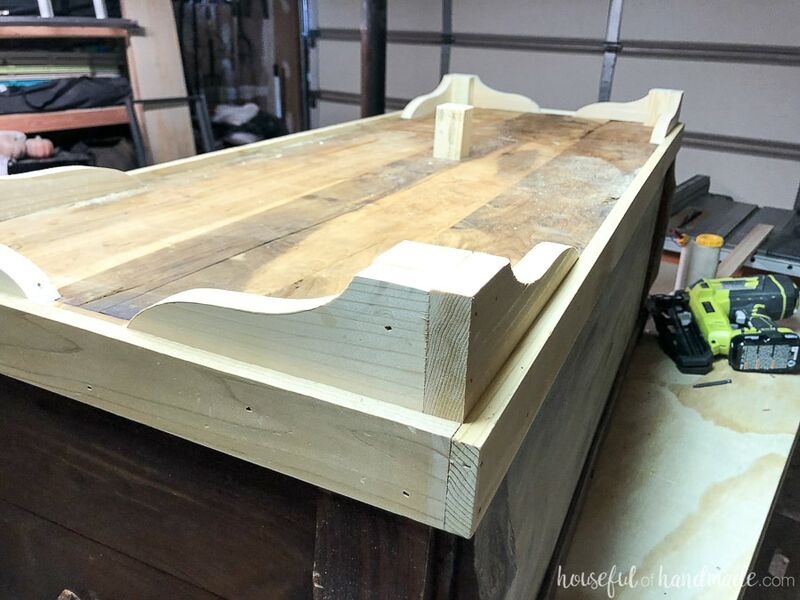 Today I am sharing our upcycled chest to coffee table as part of the monthly Furniture Flippers series. 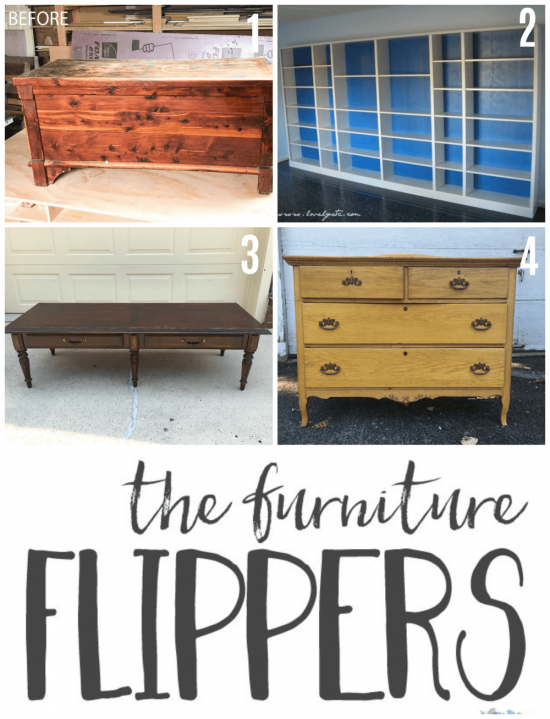 We are all sharing tips and techniques along with our current furniture flip project. 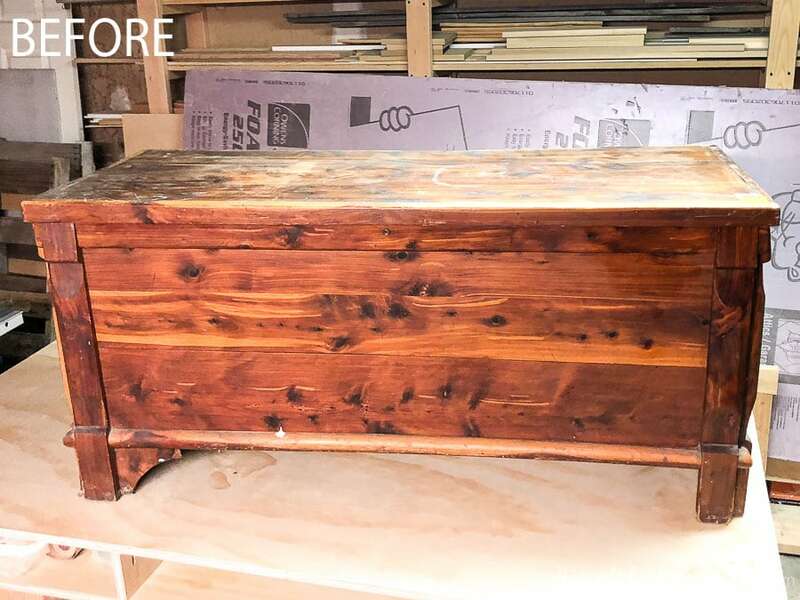 So make sure to visit the other posts below after you see how we transformed this old chest. I have been looking for a storage solution for our blankets for some time. The old chunky blanket ladder that we used to hang them on just didn’t fit in our reorganized space. But with the cold winters we have, and my love of cuddling up with a blanket watching a movie, getting rid of blankets was not an option. 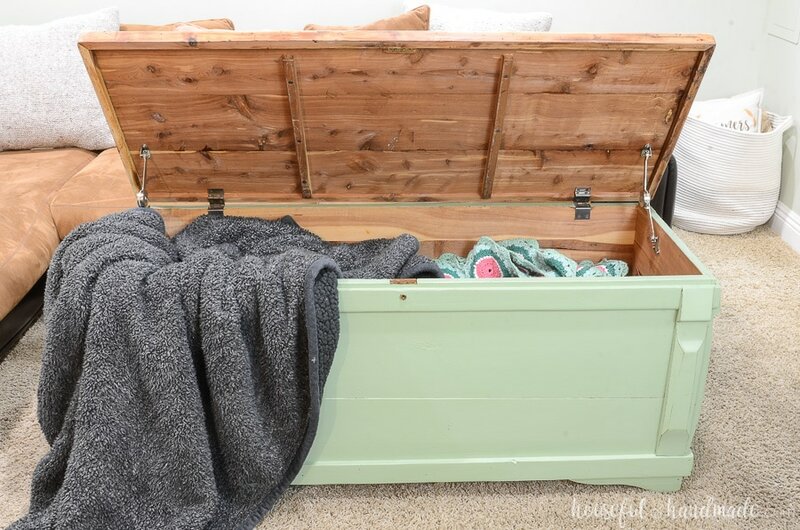 So when I saw the large cedar chest I knew it was the solution to my blanket storage problem. And bonus, the chest was built out of cedar wood. Perfect for a storage chest! With the price tag of $40 and armed with a 30% off coupon, I couldn’t pass it up. Is the piece made from quality materials? I recommend putting time into restoring or upcycling solid wood pieces not inexpensive laminate or melamine furniture. Is the wood in good condition? Check for water damage, rot or mold. Will the piece fit in my house? It is really easy to fall in love with something only to discover it is too big (or small) for the intended space. Do I have the time and patience it will take to upcycle the piece? If you need something today, maybe buying a used piece isn’t the best option. But if you have time to work on your project and the patience it will inevitably take, you will love the experience and hopefully the final results. When I got our new storage coffee table home, I realized the damage to the base of the piece was more extensive than I originally assessed. I thought it was just missing some decorative pieces of the base, but in actuality there were large pieces of the feet missing. That did not scare me away from creating the perfect living room storage spot! I knew I could use my woodworking knowledge to quickly replace the base and feet. I even had some left over cedar from our DIY vertical garden in my scrap wood stash. 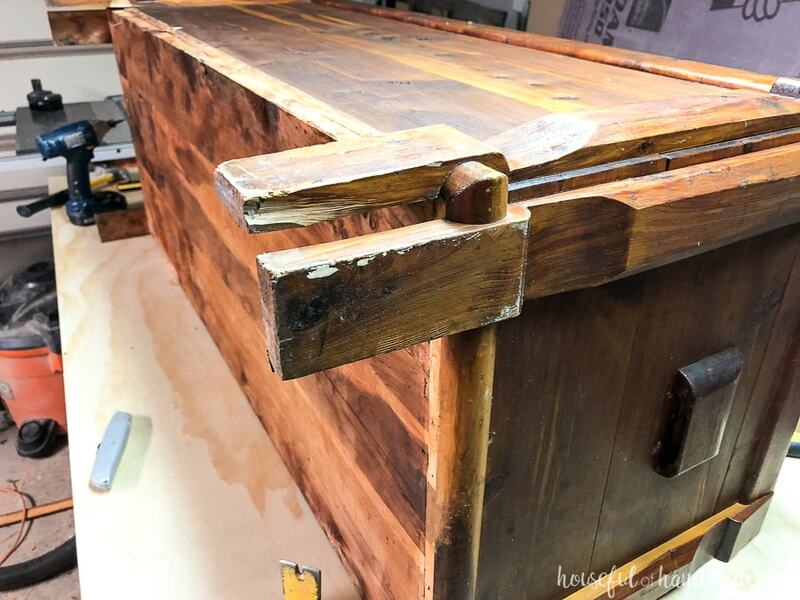 There were 3 parts to our storage chest makeover. First I had to remove the broken base/legs and build out the new ones. Second, sand and paint the body of the chest. And lastly, strip and stain the lid. In total, it only took a couple days to complete this fun makeover and I love the results. I started by removing all the pieces that were just attached to the bottom of the chest. They were held on with just nails so a couple strong hits with the hammer loosened them up nicely. The decorative front pieces were a single piece that ran all the way to the floor, over the missing legs. That was probably the only reason the chest was still standing! Instead of removing them completely, I used a utility knife to score and break the pieces at the thin point near the bottom. And I removed the rounded bottom trim. Next I used some left over cedar fence picket wood to create a trim around the entire base. This butted right up against the decorative pieces that were cut and helped cover up the less than pretty joints on the bottom of the chest. To make new legs, I cut some 1×3 cedar boards into decorative feet with a jigsaw. Then I cut some 2×2 boards to the same height as the decorative feet. I secured the feet to the base of the chest with some picket hole screws and 1″ finish nails and lots of wood glue. The 2×2 feet were there to hold most of the weight and the decorative feet were attached to it and the chest. All in all, this is way sturdier than when I bought it. I even added a center foot to help prevent the bottom of the chest from further sagging (and hopefully help push it back up a little). A good sanding on the old and new and it was ready for paint! 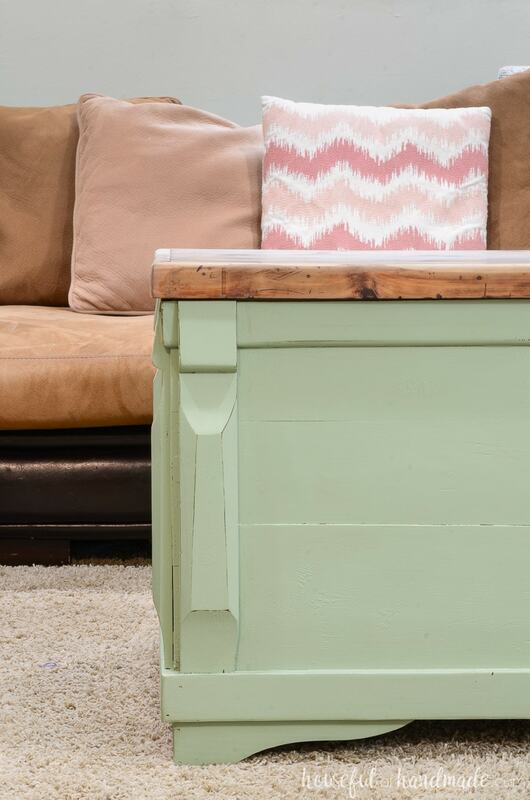 I chose to paint the new coffee table with Chalky Finish paint from DecoArt. This is my first time using it. The chalky finish paint is suppose to be extra durable, and requires less prep work, so it sounded perfect for living room piece that is sure to get lots of love. Even though this paint requires “less prep” I still took time to get my piece ready. 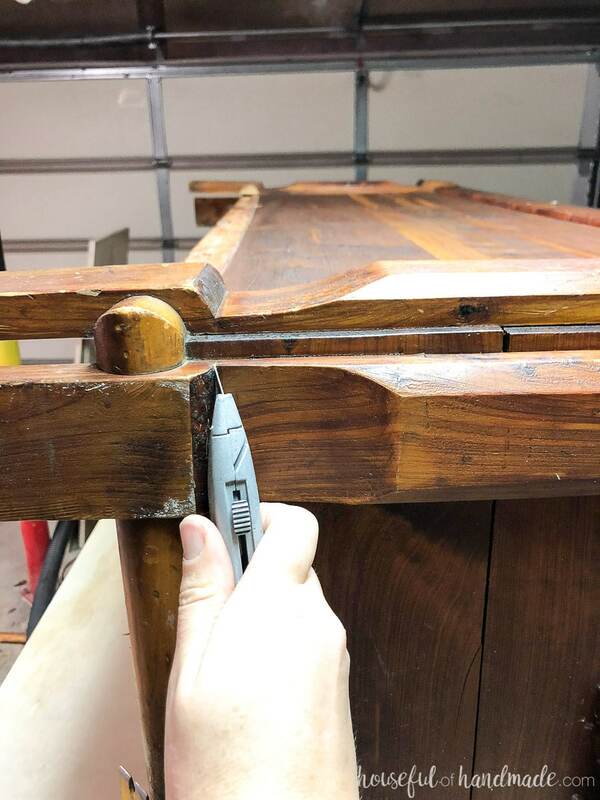 Remove hardware, hinges, drawer slides, etc. Store all the pieces in a zip top bag with the coordinating screws so you don’t loose anything. 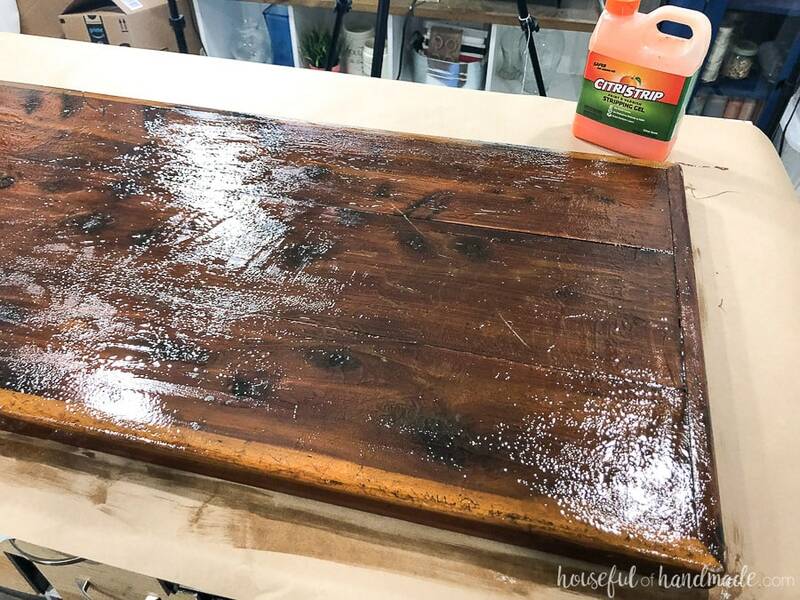 Clean the entire piece with a mixture of approximately 3 parts water to 1 part distilled vinegar and a couple squirts of dish soap. This will help remove any built up grime. If it’s really dirty, mix up a second batch of cleaner and give it a second scrubbing. Sand the areas to be painted with a medium grit sandpaper to scuff up the surface. This is necessary to give the paint something to adhere to. 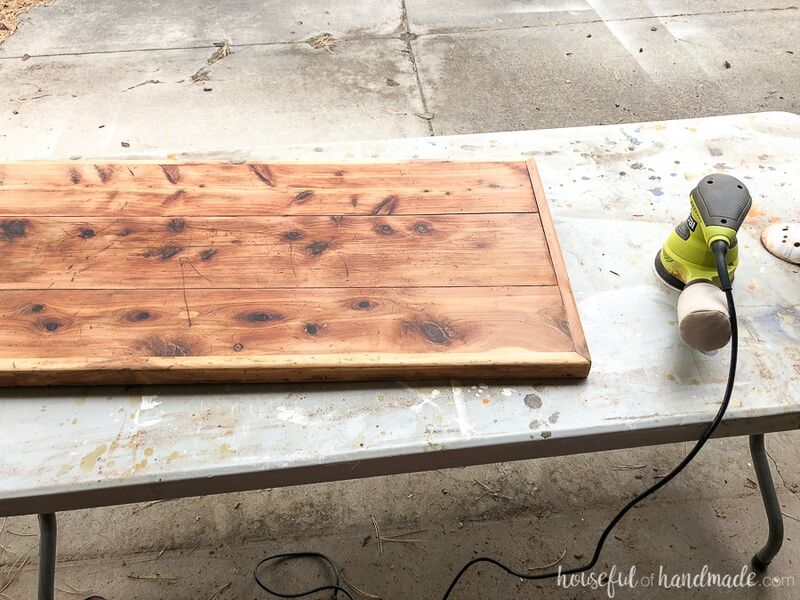 Use flexible sandpaper to get into all the nooks and crannies. 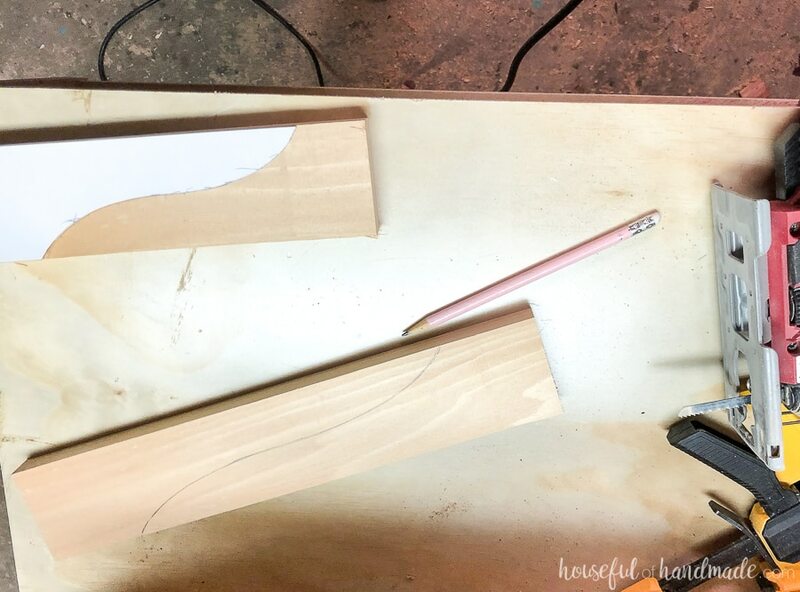 Wipe off all the sanding dust with a tack cloth or a slightly damp cloth (but make sure to allow it to dry fully if using a damp cloth before painting). 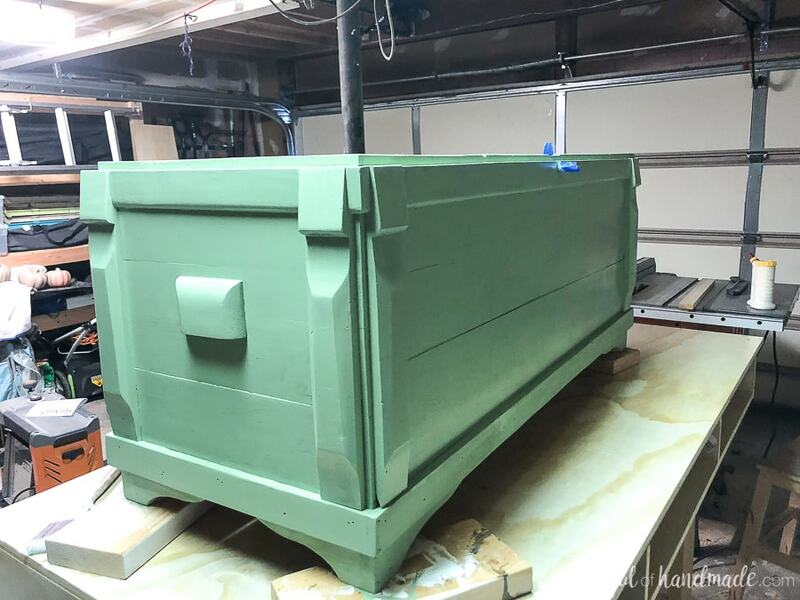 Once the piece was ready for paint, I gave it 2 coats with a small paint brush to help me get into all the details. After the paint dried, I used a piece of 220 grit sandpaper to add some distressing to the edges of the decorative pieces to really make the unique shape pop. 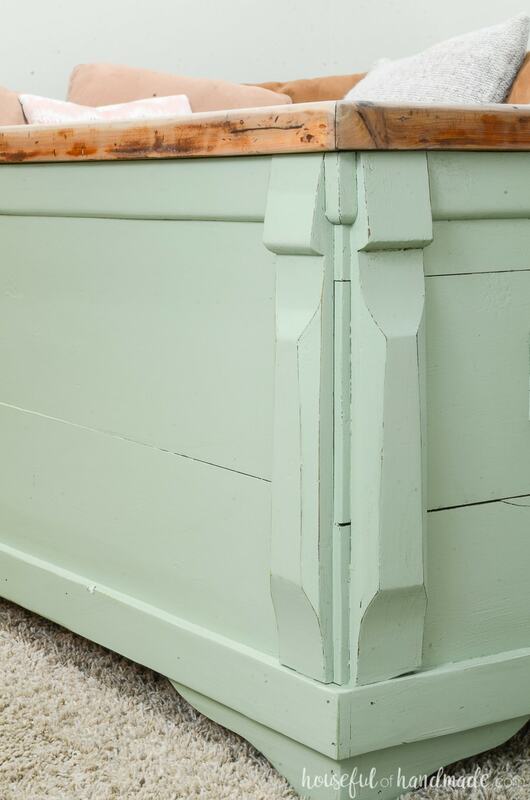 The chalky finish paint distresses easily with just a few swipes of the sandpaper. When distressing, always start small. You can always add more but it’s way harder to fix it if you take off too much! To give the upcycled chest more of a coffee table look, I wanted to leave the lid bare wood instead of painting it. Also, the I am sure my kids would scrape off the painted top in no time at all (they play hard in the living room). And since the lid is straight and solid, it was easy to strip the finish from. It would have been harder to do on all the detailed parts. I used CitriStrip to remove the finish. It is pretty easy to use and doesn’t smell totally like chemical stripper. I covered the entire lid in a nice coat of the stripper and let it sit for a few hours. To remove the loosened finish, I used an inexpensive putty knife to scrape the CitriStrip off. This is so satisfying! And you can start to see the pretty wood underneath the old, dated stain. After scraping all the finish I could off, I cleaned the entire surface with mineral spirits. This takes off the remaining CitriStrip residue. Then I busted out my sander to get a smooth clean surface. There was still a decent amount of finish on the piece. I probably could have done a second coat of CitriStrip. But I am impatient and just let my orbital sander do the heavy lifting. I started by sanding with a 100 grit sandpaper to remove the rest of the finish, then I switched to a 220 grit sandpaper for the final sanding. The cedar still had quite a red tone to it, which cedar normally does. But I wanted to give the lid a little more of a worn color. I added a coat of Varathane Aged Wood Accelerator to give the wood some gray tones and it worked like a charm. Using the same hinges, I reattached the lid to the storage chest. To save my kids fingers, I replaced the broken lid chain with these soft close hinges. I also gave the entire piece a coat of wax to give the piece a protective finish. I love the matte finish of the furniture wax. I love how the upcycled chest turned out. It is the perfect coffee table for our sectional. And I cannot believe how much storage it gives us. All our blankets fit inside it with room to spare! We are ready for the coming winter with a space to keep all our blankets. And we even have the perfect coffee table to hold our popcorn bowl while enjoying a family movie night! 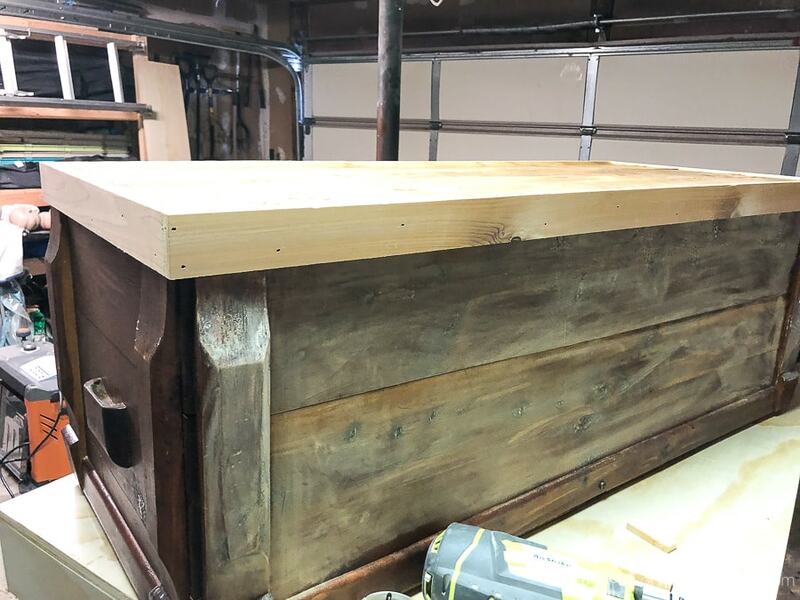 This chest turned out amazing! Such a good idea to just rebuild the feet and add that decorative touch to the bottom. 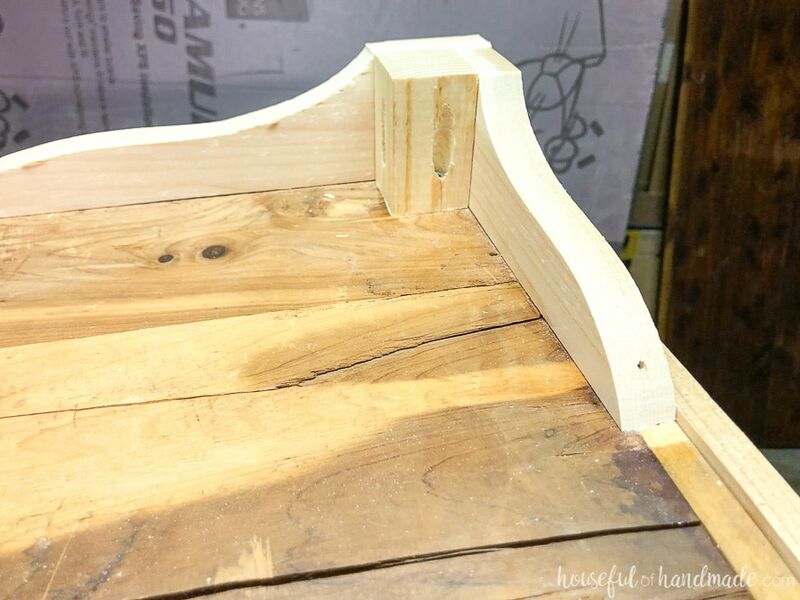 I LOVE how you chose to strip the top to the natural wood – it looks amazing, and best of all, it’s totally functional. RIght now our blankets are in a pile in the corner…haha! Our blankets were in that same corner pile until I found this! It was like fate telling me to finally take care of our little blanket problem 😉 And the natural wood top is one of my favorites too. Looks so nice with the painted bottom. What a fantastic coffee table makeover! I love the green color you used for the base. Thanks Lindsey! The green turned out so great! This makes such a great coffee table! And I love the new feet you made – great save! Thanks Carrie! We are loving having a place to store all those blankets for fall. Very cute! Just wondering if the inside of the chest smells like cedar. I have one very similar to yours and would like to use it for the same purpose except the smell of cedar is so strong that I can’t store anything in there. The inside is untreated and unpainted so it does smell like cedar. I love it because I love the smell and it helps keeps bugs out of things you are storing. But if you want to cover up the smell, you can paint the wood with a paint or primer that is made to block smells.